Head-mounted devices for virtual and augmented reality come in different shapes and sizes from the minimal Google Glass to the fully immersive HTC vive. At it’s core, head-mounted displays (HMDs) consist of two primary structural elements: optics and image displays. Before looking at (pun intended) the fundamentals of optics, it is important to understand the basic properties of the human eye. It is defined as the total angular size of the image visible to both the eyes. 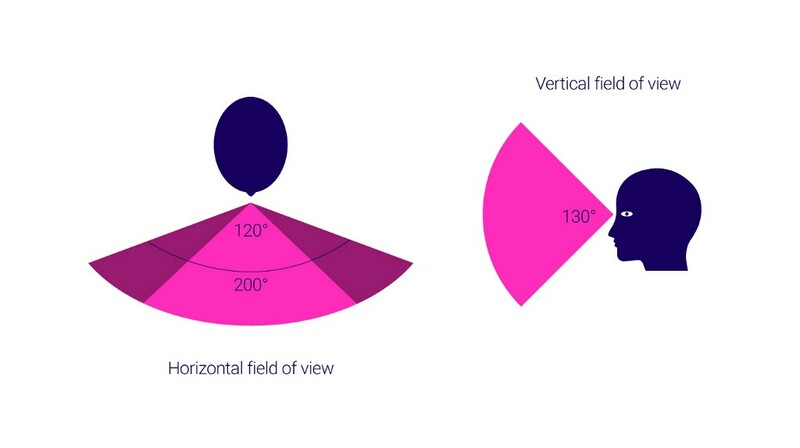 On an average, the horizontal binocular FOV is 200 deg out of which 120 deg is a binocular overlap. The binocular overlap is especially important for stereopsis and other depth cues discussed further. The vertical FOV is approximately 130 deg. 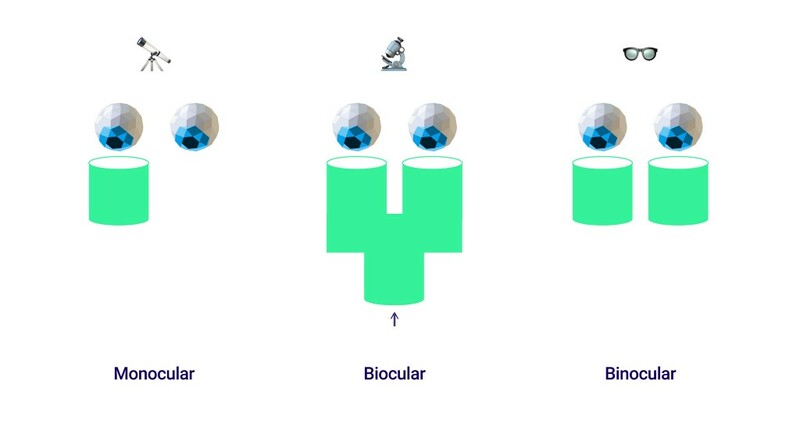 As the name suggests, it is the distance between the pupils of the eyes and is an extremely important consideration for binocular viewing systems. This distance varies from person to person, by gender and ethnicity. An inaccurate IPD consideration can result in poor eye-lens alignment, image distortion, strain on the eyes and headache. Mean IPD for adults is around 63mm with majority in the 50–75mm range. The minimum IPD for children is around 40mm. This is the distance from the cornea of the eye to the surface of the first optical element. It defines the distance at which the user can obtain full viewing angles. This is an important consideration especially for people who wear corrective lenses or spectacles. Eye relief for spectacles is approximately 12mm. Enabling users to adjust the eye relief is extremely important for head mounted displays. This is the diameter of light transmitted to the eye by an optical system. This is the volume within which users can place their pupils to experience the visuals wholly. Ocularity is the measure of the number of eyes needed to see something. Since most of us have a maximum of two eyes, the limit of ocularity in smart displays is likewise. This display provides a single channel for viewing often through a small display element and lens. The channel is positioned in front of one eye where the user is free to view the real world completely through another eye. Monocular displays are often used as information displays due to their small form factor. However, these type of displays provide no stereo depth cues and often result in very low contrast. Google Glass is a type of monocular display. This type provides a single viewing channel to both eyes by means of internal reflections. Biocular displays lack stereopsis and are suitable for close proximity tasks. Each eye gets a separate view in these type of displays creating a stereoscopic view. These display types provide the most depth cues and a sense of immersion however, they are the heaviest, most complex and computationally intensive displays. Collimation of light such that the image appears at a greater distance than it’s physical distance. Magnification of the display image to make it appear larger than it’s actual size. Relaying of light patterns to the viewers eyes. There are two primary optical design systems, or architectures for AR and VR displays: pupil forming and non-pupil forming. These consist of a single lens and are commonly seen in popular immersive displays such as HTC Vive, Oculus Rift and Sony PSVR. This type of architecture uses a single magnifier to directly collimate light from the display panel. The non-pupil forming architectures result in lighter and more compact designs with a large eye box, however they create a significant distortion when bending the light field. This effect is known as pincushion distortion. 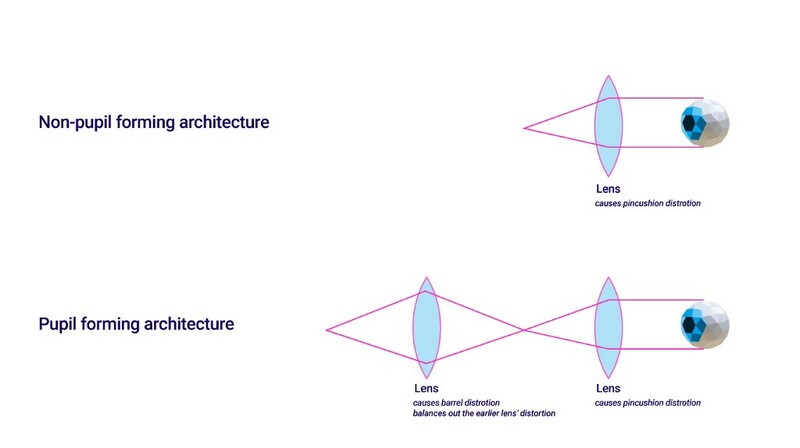 In pupil forming architectures, another lens that produces a barrel distortion is used to nullify the effect. These are often used in non-immersive type displays such as Microsoft’s Hololens and Google glass. This is a fairly simple type of wave-guide with optical elements like lenses used for in-coupling (entry) and out-coupling (exit) through a series of internal reflections. This type of waveguide is used in Sony’s Smart Eyeglass displays. Precise surface relief gratings are used to achieve internal reflections for a seamless overlay of 3D graphics through the display. These waveguides are used in a number of Vuzix displays and Microsoft’s Hololens. Light enters the waveguide and through a series of internal reflection on a partially reflective polarized surface. Selected light waves cancel out (polarization) exiting into the viewer’s eye. The method is used by the Lumus DK-50 AR glasses. This is similar to the holographic waveguide in which a single planar light guide is used with one or more semi-reflective mirrors. This type of waveguide can be seen in Epson’s Moverio as well as Google Glass. These are standard fully immersive virtual reality displays. These stereoscopic displays are combined with sensors to track position and orientation. They completely block the user’s view of the outside world like in the book ‘Ready Player One’. In Optical see through glasses, the user views reality directly through optical elements such as holographic wave guides and other systems that enable graphical overlay on the real world. Microsoft’s Hololens, Magic Leap One and the Google Glass are recent examples of optical see through smart glasses. With these type of smart glasses, the user views reality that is first captured by one or two cameras mounted on the display. These camera views are then combined with computer generated imagery for the user to see. The HTC Vive VR headset has an inbuilt camera which is often used for creating AR experiences on the device. LCDs are common in high definition televisions and have been used in ARVR displays since 1980s. This display type consists of an array of cells containing liquid crystal molecules sandwiched between two polarizing sheets. This contraption rests between thin glass substrates printed with millions of transistors. For colored LCDs, an additional substrate containing red, green and blue filters is positioned over each cell of the substrate. 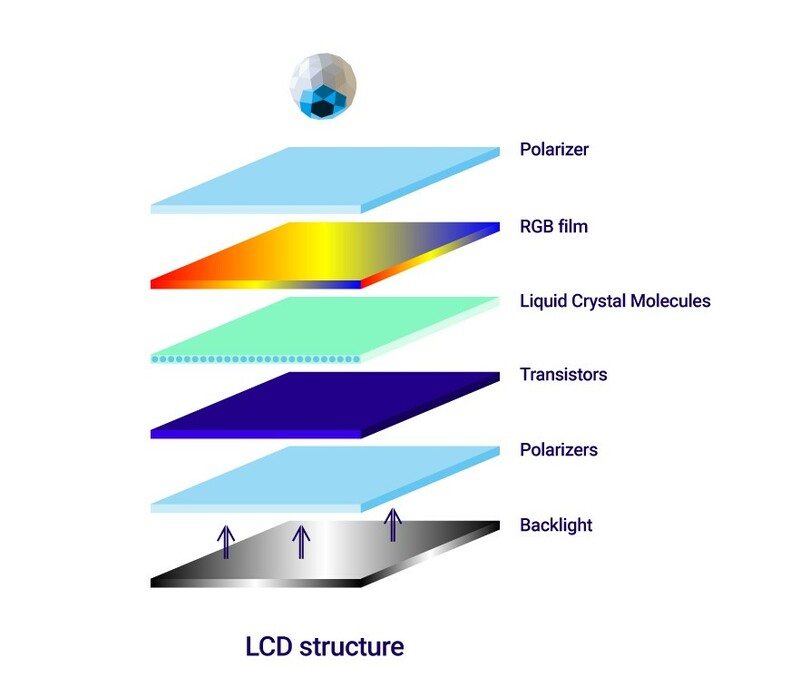 A single RGB liquid crystal cell is called a subpixel. Three subpixels form one pixel. A electric current is passed through the glass substrates. Varying the current allows the LCD to modulate the passage of light to create a precise color. If all subpixels are fully open, it creates a white light. Liquid crystal cells do not emit their own light and require backlighting. The liquid crystal cells can only vary the passage of light to create the desired color and subsequently an image. Like CRTs, this display type consists of a complex electronic grid to sequentially control individual pixels in each row. It does not contain storage capacitors making update rates slow and a high power consumption to maintain a pixel’s state. These are mainly used for simple character and iconic displays. Unlike PMOLEDs, AMOLEDs consist of a thin transistor layer that contains a storage capacitor to maintain each subpixel’s state providing greater control over individual pixels. In case on AMOLEDs, individual pixels can be completely switched off enabling deeper blacks and higher contrast. These are most suitable display types for near-eye virtual and augmented reality devices. OLEDs and AMOLEDs in particular are far superior to LCDs. Their construction is relatively simpler and they can be extremely thin since there is no need of external backlighting. In addition to this they consume significantly less power, have faster refresh rates, high contrast, great color reproduction and higher resolutions. Most fully immersive HMDs utilize this technology. Originally developed by Texas Instruments, DLP chip is also referred to as a Digital micromirror device (DMD). The display consists of about 2 million individually controlled micromirrors each which can be used to represent a single pixel. Each of these micromirrors measure approximately 5.4 microns. What is interesting about these displays is that the retina of the eye itself serves as a display surface. RGB light is reflected on these micromirrors which tilt towards and away from the light source. As each micromirror can be reoriented in either direction thousands of times in a second, varying the reflected color can produce different shades of light on the retina. 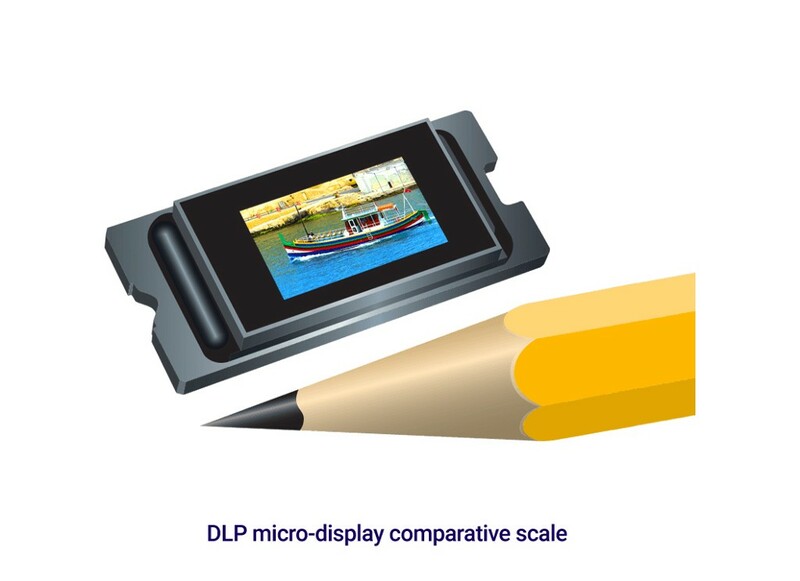 DLP Microdisplays are one of the fastest display technologies in existence. Their speed of color refresh, low latency, low power consumption and extreme high resolutions (0.3 inch array diagonal enables a 1280 x 720 image) make them ideal candidates for building head-mounted displays. LCoS Displays lie somewhere in between LCD and DLP displays. LCD is a transmissive technology where the image is generated and transmitted to the user while DLP is a reflective technology where individual subpixels are reflected through micromirrors. Light source is passed onto a reflective surface. As the light reflects, it passes through a series of sub filters that modulate the light intensity and color. Similar to DLP displays, their small size enables considerable flexibility when integrating with small form factor devices. 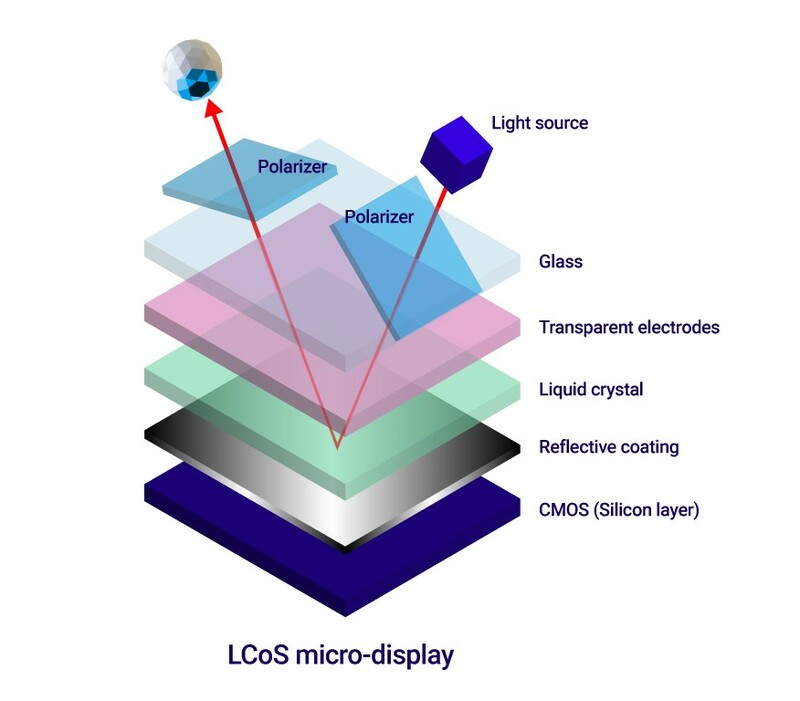 Microsoft’s Hololens, Google Glass and even the Magic Leap One uses an implementation of LCoS Microdisplays. Given the extreme resolutions of display technologies in development, it is almost certain that flat panel based HMDs might become a thing of the past for AR devices. 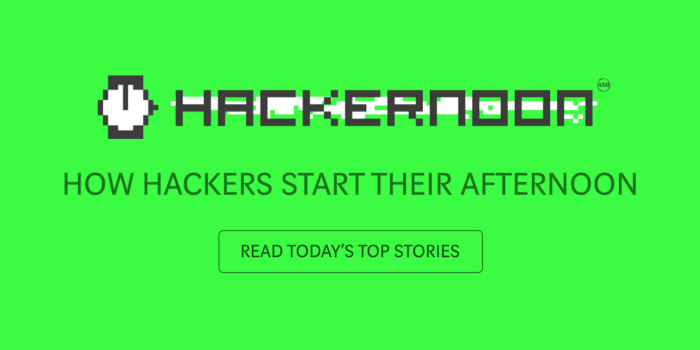 If you liked this article, please click the 👏 button (once, twice or more). Share to help others find it! Fundamentals of display technologies for Augmented and Virtual Reality was originally published in Hacker Noon on Medium, where people are continuing the conversation by highlighting and responding to this story.